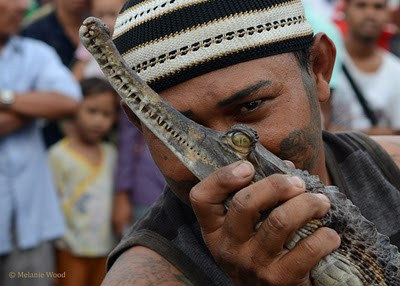 Inked across the man's face are two green snakes, jaws wide, fangs long. With his lips between them, the two tattoo snakes face off. In the last light of day, Slamet is the cynosure at Fatahillah Square, Kota. He braids three live snakes around his head into a turban. One has its mouth sellotaped shut. "Who wants to hold one?" A woman steps forward. The slogan across her blue t-shirt reads, Without Significant Intelligence. 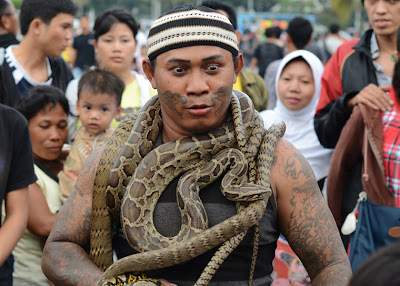 Slamet coils two snakes like winter scarves around her neck and she grins for someone's mobile phone camera. She slips Slamet some money for the privilege. 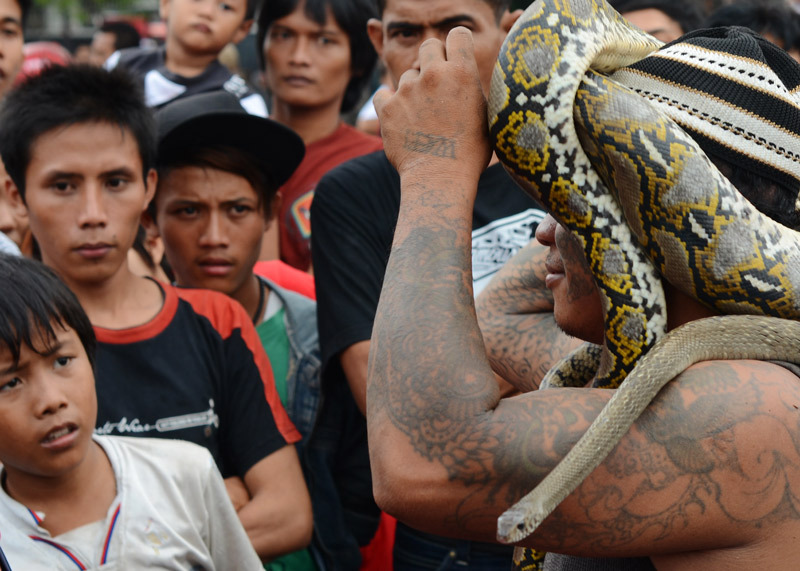 Opening the largest of four plastic containers, the size of a trunk, Slamet grunts as he heaves out a 60kg reticulated python. "It'll eat me!" the woman squeals. Now a third container is opened. The crowd gasps and unanimously retreats a pace. "Komodo," someone exhales. 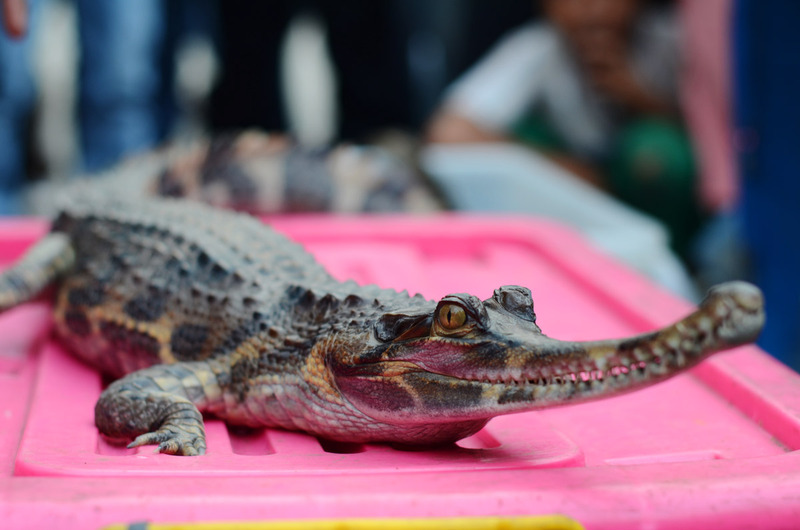 Inside, with an elegant, elongated snout, is a young crocodilian: a tomistoma. Slamet forces open the tomistoma's jaws, revealing a pearly interior and handsaw teeth. The little tomistoma squeezes its eyes tight shut. Tomistoma are on the IUCN endangered list, with an estimated population below 2,500 mature individuals. 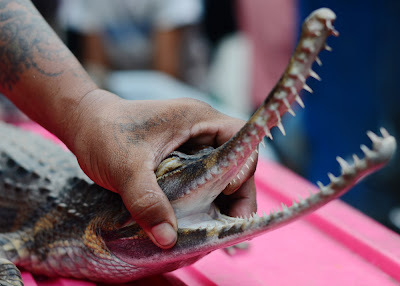 The species snapped up Indonesian news on 31 December 2008 when the bodies of a 43-year-old man and two monkeys were discovered in the belly of a 4m female tomistoma in central Kalimantan. "Next week we'll have a king cobra!" Slamet's eyes flash. He smooths the beanie on his head. The beanie is the same shades of bronze, white and black as the python. "The king cobra is good: it rears its head and you can kiss it...". Fatahillah Square is also the place to be for face piercings and bike rides. For more on snakes: feast here, but take protection. whats the story of the kid in with one eye and a rope/straigh-jacket?